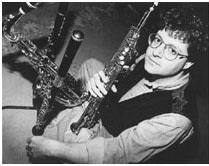 J. Michael Leonard is one of the world's foremost exponents of the saxophone, whose appearances worldwide as a soloist with orchestras and in recital have made him a musician of the most serious and devoted purpose, and an artist of international merit. Michael's electrifying performances have earned him accolades in more than a dozen countries on three continents and his reputation continues to grow. His adventurous and accessible programming, as well as his warm and approachable personality have delighted audiences all over the world. Interested parties can reach Michael either by e-mail or traditional methods for more information on appearances, recordings and bookings. © 1999, design by atom_graphics; all rights reserved.